Aim: The aim of this review is to explore the validity and/or reproducibility of dietary assessment methods used to assess food and nutrient intakes of adolescents. Method: A detailed literature search was undertaken to trace articles reporting on the validity and/or reproducibility of food records, food frequency questionnaires (FFQs) and 24-hour recalls for the dietary assessment of adolescents, especially among South Africans, in the following databases: Medline, Science Direct, Academic Search Premier, Health Source, PubMed and the South African e-publications database (SAE). Original studies published between 1990 and 2009, and relevant original articles published before 1990, were included. Of these, only three were South African-based studies reporting testing for reproducibility and/or validity. Results: Results indicated that adolescents comply better with stimated food records than with weighed food records. However, energy intake was underestimated in dolescents (by 18–42%) when using food record methods. The relative validity of FFQs among adolescents was moderate, with correlation coefficients of > 0.3 for most measured nutrients and food items. 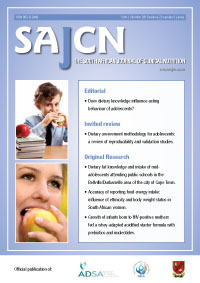 Reproducibility was fair to good among female adolescents (0.3–0.83) for most nutrients and foods, but was lower in a South African Tswana-speaking group. The 24-hour recall method showed the least over- and underestimation of all the reviewed methods. When comparing the 24-hour recall method to an observed intake method among adolescents, < 11% underestimation of energy intake was found, while < 4% underestimation was found when the 24-hour recall method was tested against the doubly labelled water method. Conclusion: Based on these outcomes it was concluded that FFQs and 24-hour recalls are valid and reproducible dietary assessment methods that can be used when collecting dietary data from adolescents. Factors to consider when choosing the best suitable method should include the gender and ethnicity of the population as well as the time frame for the collection of dietary data.